Some new(ish) analysis of climate attitudes in the US helpfully puts more solid numbers against a lot of what we’ve seen here in the past. The analysis was run by an academic at Michigan State Uni, and shows the effect of different factors on attitudes and knowledge about climate change. It’s a very straight-forward paper (go on, have a look), which draws on Gallup Polls from over the last eight years to build a dataset that’s big enough for some serious subgroup analysis. The main focus of the paper – which is picked up by Leo Hickman in the Guardian Environment Blog – is about gender differences. These are indeed interesting, and there are a few other striking issues that the analysis shows. Gender notwithstanding, the factor that is most strongly correlated with concern about climate change is an individual’s knowledge about it. This is knowledge as measured by the likelihood to answer that global warming is already happening, is man-made, and that most scientists believe it is occurring – rather than a stated level of personal knowledge (which yields quite different results). Of course, some people would dispute these as objective measures of knowledge. I see two possible readings of this correlation between concern and knowledge. You could argue that this proves that if someone knows about climate change, that knowledge makes them worry. But the alternative causal direction could also be valid. Someone who – for whatever reason – has become concerned about climate change then goes onto learn more about it, and this knowledge could potentially not have any impact on their overall level of concern (in theory). Political ideology and party affiliation: the more Democratic and liberal a person is, the more likely they are to be knowledgeable and concerned about climate change. Is concern about climate change greater among elites? How far is concern about climate change the preserve of the elite? It’s a simple question, but one that I’ve not previously seen answered convincingly. Many of the polls I’ve covered break out the data by social grade and education, but yet none of them show really clear distinctions in attitudes towards climate change. However, a new poll by YouGov does show something different. Their poll was commissioned by Chatham House, and sampled both UK general public, and a YouGov panel of ‘influential people’. Here, there was more difference between the audiences than I’ve seen from looking at distinctions of social grade or education, with the elite panel apparently significantly more concerned about climate change than the rest of the population. First, a quick word on the panel. It’s operated by YouGovStone, a partner agency of YouGov, who say it “includes Parliamentarians, business leaders, senior journalists, senior professionals in health and education, academics and charity leaders”. I can’t find any more details about the make-up of their panel, so have no way of knowing what this means in practice. A panel may include these people, but that doesn’t necessarily mean that it only includes these people, or that they participated in all of the polls sent to them. Nonetheless, I have no reason to doubt the assertion that the panel represents “‘elite’ opinion-formers”. 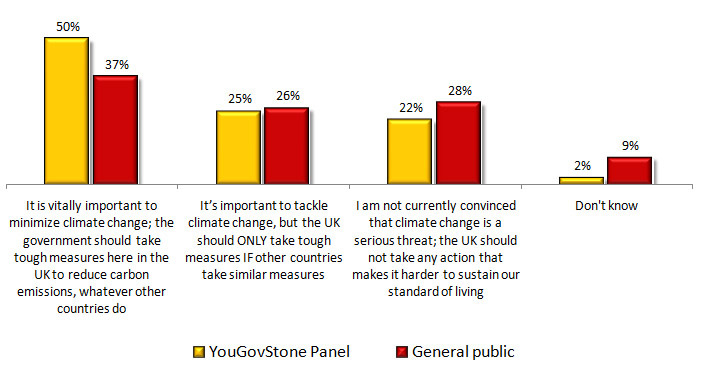 Two years ago last month, Defra released their report on the UK population’s attitudes and responses to climate change. It’s a detailed analysis that separates the country into seven different groups, defined by what they think about climate change, and what they’d be likely to do about it. It’s exactly the kind of tool that climate campaigners need, to understand better how different people feel about climate change and low-carbon behaviours. Yet it doesn’t seem to have made tidal waves beyond government circles. After a pub conversation the other day about the role that climate change will play in the election, I wanted to have a look at the demographic profile of those whose vote is more likely to be influenced by the environment. It’s tempting to assume that green beliefs and actions are concentrated in certain groups of people, like the young. But, to borrow from Ben Goldacre, I think you’ll find it’s a bit more complicated than that.